Milkweeds (Asclepias spp.) are a remarkable group of more than 100 species occupying a wide variety of habitats and plant forms in North America. Most central New Yorkers recognize the aggressive common milkweed (Asclepias syriaca) or the cultivated and colorful forms of butterflyweed (Asclepias tuberosa, FLNPS Plant Profile, July 2005) and swamp milkweed (Asclepias incarnata). Few, however, will recognize the peaceful woodland poke milkweed (Asclepias exaltata) of area forests. 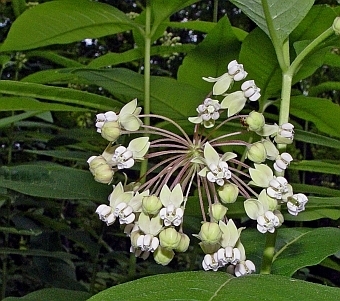 Poke milkweed naturally occurs in moist forests of eastern North America. Poke milkweed grows well in heavy shade, but it reaches its highest reproductive capacity along forest edges, power line cuts, and roadways that pass through forest. In central New York, poke milkweed is common along the dirt roads of Shindagin Hollow in Tompkins County. 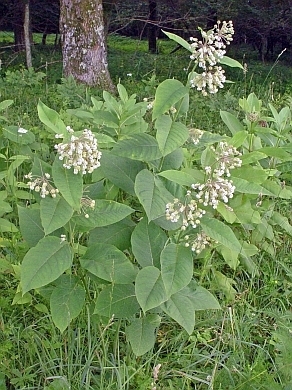 Poke milkweed is most easily recognized by its tall stature, loosely packed inflorescences of whitish flowers, and broad leaves that resemble leaves of pokeweed (Phytolacca americana). The flowers produce ample nectar and will attract a wide variety of insects and the occasional clever hummingbird. The floral design of milkweeds is highly unusual as the hoods modified from stamens are most colorful and serve as nectar reservoirs. The greenish petals of poke milkweed reflex back along the flower stalk and cover the diminutive sepals. 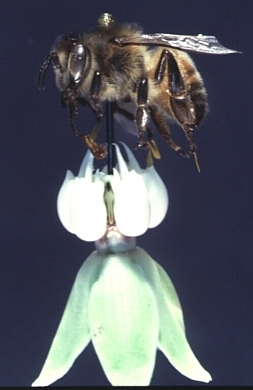 Like all milkweeds, pollen is dispersed in “saddlebag-shaped” pollinia that attach to the legs of nectar foraging insects. Each pollinium carries more than enough pollen grains to sire a complete set of seeds in a milkweed pod. 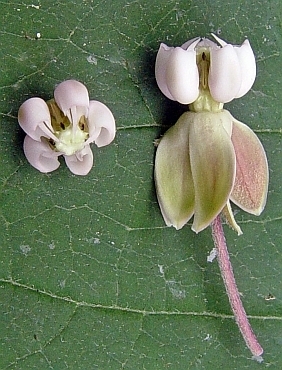 Although poke and common milkweed rarely grow together, when they do there is a potential for pollen exchange and formation of hybrid seeds. In my studies of milkweed hybridization, hybrids between these two species is most common in the southern Appalachians where roadway cuts bring these two abundant species into close contact. Hybrid plants look remarkably intermediate to the two parents, although they frequently display a wider range of flower colors than poke milkweed. I have yet to find a natural hybrid of poke milkweed in New York State. The best growing conditions for poke milkweed appear to be those with bright, indirect sunlight, and moist cool conditions. Although I have grown poke milkweed in full sunlight, the plants lack the graceful stature and the leaves become slightly sun-bleached. The species is not aggressive, although individual plants may live for decades and will spread if given space. 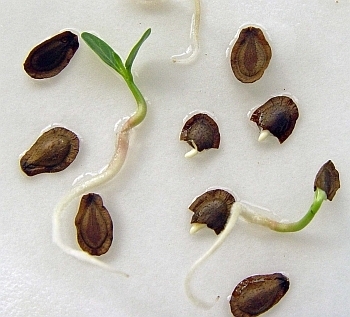 Most propagation guides suggest that cold stratification is necessary for milkweed seed germination. I have a secret strategy to violate this rule and produce seedlings quickly for those who want only a few plants. Seeds are allowed to absorb water for two or three days. In my lab this is accomplished on filter paper in Petri dishes, but could also be performed on moist paper towels in a plastic container. The moistened seeds are then cut either along one side or the seed coat is removed over the young root using a single-edged razor blade. The nearly intact seed is returned to the moist container or directly planted into soil. Usually cotyledons emerge to produce healthy seedlings in a 7-10 day period. I have successfully used this method with more than twenty milkweed species and the seeds have ranged from freshly collected to five years old.